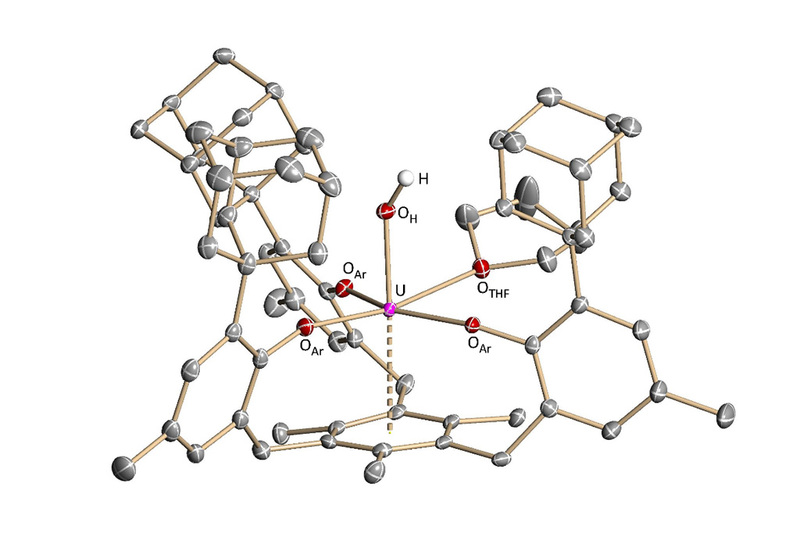 Chemists at FAU have found a new use for depleted uranium, the waste product of nuclear energy which has been accumulating over decades: they have developed a uranium-based catalyst which converts water into oxygen and hydrogen. The hydrogen produced in this way can be used as a sustainable energy carrier to store the different kinds of renewable energies which are not constantly available. The researchers have recently published their findings in the journal Nature (DOI: 10.1038/nature16530). It is currently one of the key challenges for mankind to tackle continuously rising energy consumption without polluting the environment any further. In the course of the nuclear phase-out taking place in Germany, the conversion of renewable energies into storable, technically usable forms of energy has become particularly important. Hydrogen – which can be produced sustainably by the catalytic decomposition of water (H2O) into hydrogen (H2) and oxygen (O2) – is particularly useful for generating the vast amounts of energy required in order to guarantee a reliable energy supply. However, in order to be able to use catalytic water splitting on an industrial scale, new, suitable catalysts are required. Due to its high chemical reactivity and its particular atomic structure uranium is a very promising catalyst. Moreover, due to its low level of radioactivity, uranium, which occurs naturally in minerals, is easy to handle and thus particularly interesting for researchers. Depleted uranium (isotope 238U), a waste product of the nuclear energy industry, has even lower levels of radioactivity than natural uranium. Therefore, researchers around the globe have been attempting for decades to develop uranium-based catalysts. 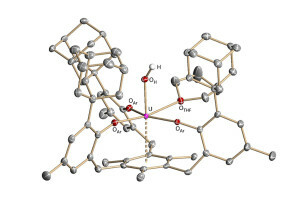 A group of researchers at FAU’s Department of Inorganic and General Chemistry led by Dominik Halter, Prof. Dr. Karsten Meyer and Prof. Dr. Julien Bachmann have now succeeded in doing exactly that: they have developed the first uranium-based catalyst for the electrocatalytic splitting of water into hydrogen and oxygen. ‘For the first time, we have been able to show that it is generally possible to use uranium as a catalyst for electro-chemical H2 production,’ says Dominik Halter. The molecular catalyst is a metal complex of depleted uranium which makes it possible to actively use this waste product that has previously been stored away as a source of raw material. The mechanistic studies contribute considerably to the general understanding of uranium’s reactivity. In future, they will help achieve further reactions such as the exploitation of the gases carbon dioxide and nitrogen dioxide, which can only be used as raw materials with difficulty at the moment. After its catalytic reduction with uranium, carbon dioxide could be converted into fuels such as methane and petrol, while the reduction of nitrogen dioxide with uranium could be an inexpensive alternative to the rather energy-intensive Haber Bosch process currently used to produce ammonia for fertilizer.